In baseball, if you are in the major leagues, then you got your start somewhere, and it is usually as a rookie in the minor leagues or "farm system" as it is colloquially known. And, if you came up through the farm system then that likely means you first played in the minors in Arizona or Florida. Sure, players can skip the minors, but that is rare. If you are visiting Phoenix or the surrounding area in the summertime, you might want to consider catching a free game one night. It can be a neat thing to see future baseball stars in their early years. 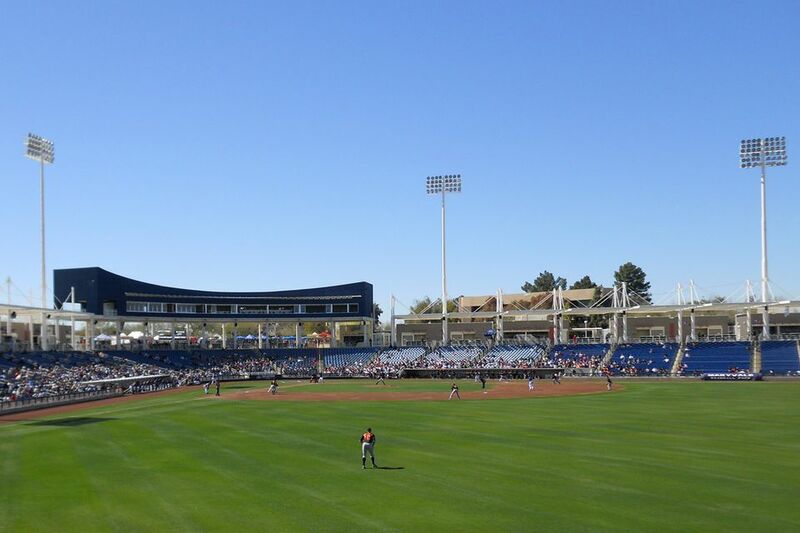 The rookie Arizona League teams, which are the minor league-affiliated teams for the West Coast, Midwest, and Southwest major league teams, play their season in Phoenix and at neighboring stadiums in Mesa, Tempe, Scottsdale, Surprise, Goodyear, or Peoria. Each of these stadiums or sports complexes is within 20 miles of downtown Phoenix. There are 18 teams in the Arizona League. The Arizona League's aligned into three divisions: the East, Central, and West divisions. The farm teams that are members of the Arizona League are the Los Angeles Angels, Oakland As, Chicago Cubs, Arizona Diamondbacks, San Francisco Giants, Milwaukee Brewers, Los Angeles Dodgers, Cleveland Indians, Cincinnati Reds, Chicago White Sox, Seattle Mariners, San Diego Padres, Kansas City Royals, and Texas Rangers. Leagues at the rookie-level play a shortened season, starting in mid-June and ending in late August or early September. The Arizona League's season consists of 56 games. Teams do have post-season playoffs in September. The six teams who win their division in the first and second half of the season qualify for the playoffs. If a team wins both halves, the next best team in that division by overall record qualifies for the playoffs. The top two teams by overall record receive a bye to the semifinals. All playoff games are single elimination, with the exception of a best-of-three final. At these games, no admission is charged and no concessions are sold. This is a non-revenue generating game, which means there are no tickets, and you can find a seat where you can. Most seating is no frills, bleacher-style seating. Other people who attend these games are usually family members of the players, scouts, organizational staff, and other people who noticed the lights on and wanted to watch some baseball. There is no heckling allowed. Do not disturb the players or coaches. They are working and are not playing for your entertainment. If a ball flies foul, return the ball. Do not keep it. If you want water or food, you must bring your own. Alcohol is prohibited. Parking is usually free. There are often five or more games being played on any one day in various parts of the league. All games start at 7 p.m. local time unless otherwise specified. Check your local newspaper or Minor League Baseball schedule to find the dates and matchups of the rookie games. You have to look around for these games. Many of them will be played on practice fields at the home stadium facility if they are not being played in the actual stadium. These night games are usually easy to find, look for the fields with the lights on. You can usually tell the teams apart based on their jerseys, which usually have their home team affiliation logo. Also, the home team wears white pants and the visitors wear gray pants. This league is usually called a "complex-based league" because games are played at their affiliated clubs' spring training complexes. Although most teams are affiliated with a professional major league team, most are not owned by them. They have affiliation contracts with the teams. Team rosters comprise newly drafted players who are not ready for a higher level of play. These leagues are intended almost exclusively to allow players to hone their skills, emphasizing skill-building versus competitive play. The rookie leagues are run by Minor League Baseball. The rookie league is the lowest level of minor league and consists of the two domestic leagues, Arizona and the Gulf Coast league, and one foreign-based league, the Dominican Summer League. The players in this league are usually from other countries or drafted high school and college players from Major League Baseball's June draft. Major league baseball players may also play in these games as part of a physical rehabilitation assignment, for example, after recovering from injuries. The current minor league classification system, from top to bottom, is triple-A (AAA), double-A (AA), class A-advanced (High A or A+), class A (Low A), class A short season, and rookie. Rookie is further informally subdivided into rookie advanced, complex-based rookie, and international summer baseball. The other rookie league, the Gulf Coast League, plays a 60-game season that runs from mid-June to late August. Teams in the league are divided into four divisions: East, Northeast, Northwest, and South. There are 18 teams. All of the stadiums are in Florida. The Gulf Coast League also has playoffs. The semifinal winners meet in a best-of-three game series for the Gulf Coast League championship. The farm teams that are members of the Gulf Coast League are the Houston Astros, St. Louis Cardinals, Miami Marlins, New York Mets, Washington Nationals, Atlanta Braves, Pittsburgh Pirates, Philadelphia Phillies, Detroit Tigers, New York Yankees, Baltimore Orioles, Tampa Bay Rays, Boston Red Sox, and Minnesota Twins.